Will China’s ‘One Belt, One Road’ Initiative Deliver? For many countries in the region, China is by far the biggest source of financing: Beijing’s Export and Import Bank of China alone lent $80 billion in 2015, compared with over $27 billion from Asian Development Bank. Chinese involvement in building railways, ports, roads, dams and industrial corridors is helping to expand its economic and geopolitical sway across Asia, the Middle East, Europe and Africa. The OBOR effort has not gotten the degree of attention it deserves, says Pieter Bottelier, visiting scholar of China studies at Johns Hopkins School of Advanced International Studies in Washington, D.C. “I am concerned that its significance is underrated in the U.S. and West in general. I think it is a very positive initiative and a major vision of how China can collaborate with countries in its neighborhood, Europe, Latin America and Africa in a way that is in the long-term interest of China and [the global economy],” Bottelier says. 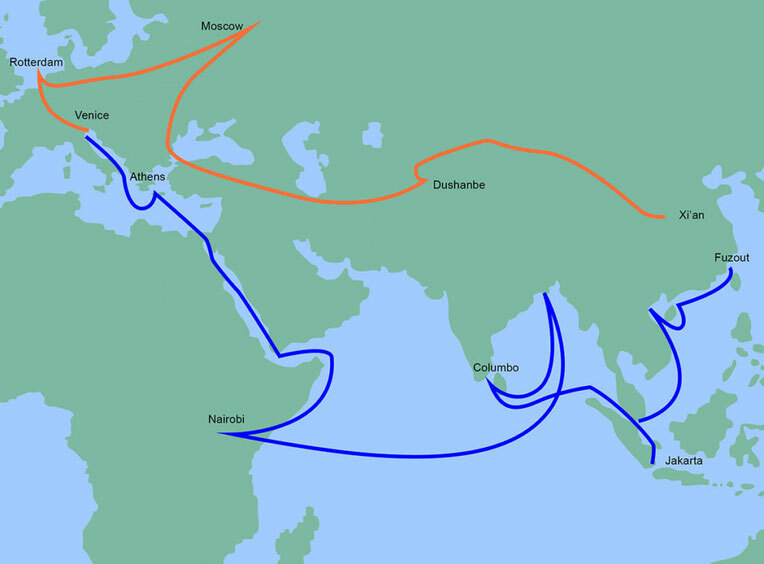 The “One Belt” refers to a “Silk Road Economic Belt” from China through Central Asia to Europe. The “One Road” refers to Beijing’s concept of a “21st century Maritime Silk Road” to connect China to Europe via the South China Sea and Indian Ocean. The initiative involves developing six economic “corridors”: 1. a China-Mongolia-Russia corridor; 2. a new Eurasian “Land Bridge”; 3. a corridor from China to Central Asia and Western Asia; 4. a China-Indochina peninsula corridor; 5. a China-Pakistan economic corridor; and 6. a Bangladesh-China-India-Myanmar economic corridor. Chinese President Xi Jinping said in his speech at the World Economic Forum in Davos, Switzerland in January that more than 100 countries and international organizations have given warm responses and support to the initiative and that more than 40 countries and international organizations have signed cooperation agreements. So far, Chinese companies have made over $50 billion of OBOR-related investments and launched a number of major projects in the countries along the route, he added. At least 65 countries are included in the OBOR initiative. The Japan and U.S.-led Asian Development Bank says infrastructure development in Asia and the Pacific will exceed $22.6 trillion through 2030, or $1.5 trillion per year. In a recent report, “Meeting Asia’s Infrastructure Needs” issued in February, the estimate rises to over $26 trillion, or $1.7 trillion per year when costs for climate change adaptation and mitigation are included. “This is a grand vision, and it may take a decade, but there is no rush. You cannot really put any number on the total investment,” says Rajiv Biswas, Singapore-based Asia-Pacific chief economist at IHS Global Insight. Noriyoshi Ehara, chief economist at the Tokyo based Institute for International Trade and Investment, says the financial infrastructure for OBOR is gradually taking shape. Apart from AIIB, China also has a US$40 billion Silk Road Fund and a New Development Bank to fund the OBOR initiative. “There has been good progress in getting these frameworks in place,” Ehara says. Ultimately, he adds, Beijing may not limit OBOR to infrastructure but may make it the foundation for regional and bilateral free trade areas (FTAs). “We are not sure if China will succeed, but the world is changing, and more and more countries are joining this initiative,” he says. With the TPP in trouble, OBOR is getting more attention. Already, more than US$900 billion in projects are planned or underway, Fitch Ratings says in a report titled “China’s One Belt and One Road Initiative Brings Risks.” It says most funding will likely come from China’s policy banks, the Export and Import Bank of China, China Development Bank and its largest commercial banks. “We estimate that outstanding loans from Chinese banks total US$1.2 trillion, and a large portion of that has financed infrastructure projects involving Chinese state-owned enterprises,” the report says. China also has other major financial resources such as its sovereign wealth fund and foreign exchange reserves. That problem already is surfacing in Sri Lanka, where China signed a deal in late 2016 to further develop the strategic port of Hambantota and build a huge industrial zone nearby. China has spent almost $2 billion so far on Hambantota and a new airport. But hundreds of Sri Lankans clashed with police at the opening of construction in January of the industrial zone in the south, saying they would not be moved from their land. It was the first time opposition to Chinese investments in Sri Lanka turned violent. Newly elected Sri Lankan President Maithripala Sirisena had said the new port deal with China was unfair in his campaign, but after taking office approved an agreement to lease an 80% stake in the port to the China Merchants Holdings for 99 years in exchange for US$1.1 billion in debt relief. Concerns over the ability of smaller developing countries to protect their own interests underscore the need for involvement of Western countries, especially from the EU, since Japan and the U.S. have continued to shun the AIIB. “You have weaker institutional capacity and weaker governments like in Cambodia and Central European countries. They may be persuaded by Beijing on take on large debt to finance projects. They and other developing countries in the past ended up with large debts incurred to finance dubious projects that do not help their economies. That is the risk for countries that do not have the capacity to independently make cost-benefit analyses,” Kuijs says. One of the main factors driving the OBOR effort is the slowdown in China’s own economy. The Communist Party is striving to transition away from growth led by investment and exports to development led by domestic consumer demand and services, and to keep growth at more sustainable levels than in the past. The government set a growth target of 6.5% in 2017 at the National People Congress in March, down from a 2016 target of 6.5% to 7%. In a sense, China is seeking to export the investment-led part of its economy, to help its own overbuilt heavy industries and provinces.